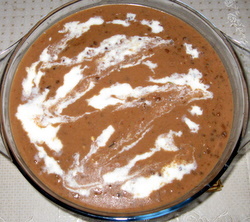 Dal Makhani - Black Whole Lentils(Matpe Beans) Cooked With Spices And Butter. Dal makhani is a recipe from North India.It is simple but very flavorsome, making it a very popular recipe. Dal means Lentil and in this recipe,Whole Black lentils(matpe beans or kali urad dal) and red kidney beans are used,along with some spices. A lot of butter or cream is essential to make this recipe. BUT,in the following recipe,you can avoid using a lot of butter,the taste will not be compromised. Also check how to add a smoky aroma in your dal,giving it a charred flavor. The preparation for this recipe starts by soaking the lentils for at least 8-10 hours. Wash and soak the dal and rajma in plenty of water for at least 8-10 hours. In a pressure cooker,heat 1 Tsp oil,put the hing and 1 Tbsp of chopped ginger-garlic.Fry a little(reduce the flame after adding this otherwise the garlic will burn). Add the soaked dal and rajma in the cooker with the water(which should completely cover the lentils and be about 2 inches more). Pressure cook till it is cooked. (after the pressure builds up in the cooker reduce the heat and cook for about 25-30 minutes,with the weight on).Turn the heat off and wait till you are able to open the lid.If the dal is soft and the water a bit slimy,then you know it is done.If not then cook some more. Meanwhile,in another pan heat the rest of oil,add the cloves,cinnamon,bay leaf and black cardamom.When this crackles then add the rest of ginger-garlic.Saute a little then add the onions.Fry them on medium heat till golden brown. At this stage add the tomatoes and cook till oil leaves the sides of the pan.Add salt and chili powder. Turn off the heat.Here if you want give this Smoky Aroma to your masala.Now transfer the dal into this pan.Add the milk,butter,garam masala,slit chilies and ginger julienne.Cover and simmer for 30 minutes stirring occasionally.Add more milk if required.Lastly add the cream and serve. Your dal makhani is ready to be served with tandoori roti or any other Indian bread or rice if you prefer.